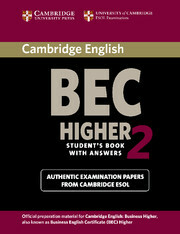  Contains authentic listening material to accompany four sets of past papers from Cambridge ESOL.  Presented in the same timed format as the live examinations.  Enables students to familiarise themselves thoroughly with the format and content of the listening paper.